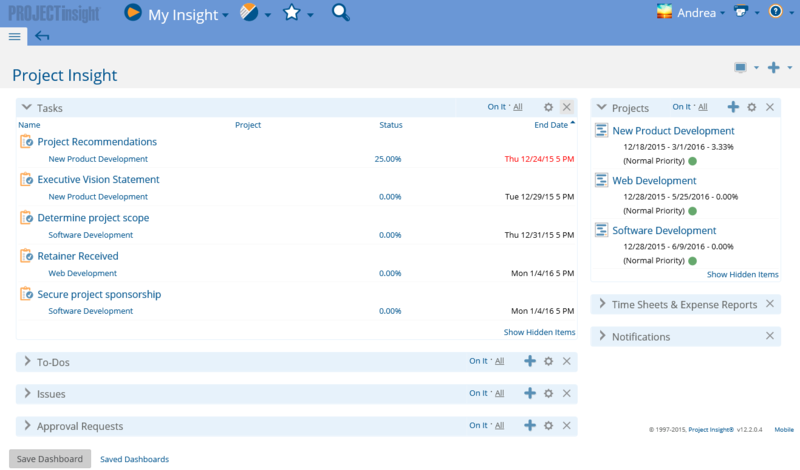 The Project Insight Dashboard is a central location where all the information that is important to you can be displayed and easily accessed and updated. There is no need to navigate around to different forms. The information is all available in one place. All the data on the dashboard is hyperlinked as well so that you can easily navigate to additional information and functions if required. For example, a team member can quickly view a list of their upcoming tasks and update them from the dashboard. They could also see a list of projects to which they've been assigned and any issues they need to work on. A project manager can configure their dashboard to display a list of all projects that they are managing. They may also have a report on their dashboard that lists any tasks that are overdue or behind schedule on the projects they are managing, so they know immediately when they login to Project Insight, what tasks require their attention. Each user always has a main dashboard. It is automatically displayed when they first log in. It will be preset with default information but it can be customized by each user as they require. Additional dashboards can also be created and can contain different information than the main dashboard. Each dashboard is easily accessible from anywhere in the system with one click. Each dashboard always has a name. The main dashboard is called Project Insight by default, but the system administrator may have renamed it to terminology that is branded or more recognizable to your organization. This name of the main dashboard can only be changed by the system administrator, but any additional dashboards that are created can be named as required by each user that creates it. Dashboards can be shared. For example, one user could create a dashboard and share it with other users on their project team. Permissions rules still apply though. Only information that you have permissions to view on a shared dashboard will appear on your dashboard even if that differs from the permissions of the person who created the dashboard. Each dashboard can be set up with different with different layouts, display options and components. A saved dashboard will allow you to design many varied dashboards with different layouts and data for easy retrieval. Saved dashboards are often used for displaying multiple reports and charts on a single page when the data required cannot be placed into one single report. Saved dashboards are also used for sharing with other Groups, Companies and Users to help standardize the most helpful dashboard components for your organization. Next to the Save Dashboard button is a hyperlink to your list of saved dashboards. This is also accessible in the list of saved Reports detail page. Once there, you can mouse over the name of the dashboard to delete the unwanted dashboard.